As we continue to do more and more on our phones and tablets, be it work, gaming, or editing that novel you've been fiddling with for years (you'll get it finished one day... ha ha), doing so on a touchscreen keyboard can quickly get uncomfortable and boring. Bluetooth keyboards are great if you're lugging your bag around with you and have the space for one, but what about if the only ting you're carrying is your phone? Easy, get the ZAGG Pocket Keyboard. In a nutshell, this is a Bluetooth keyboard that can fold up surprisingly small. But if right now you're chanting 'been there, done that, bought the t-shirt', hang on... because this baby is a bit different. The ZAGG Pocket Keyboard folds up small enough to fit in your pocket, measuring just a couple of centimetres thick. It also folds up nice and narrow, so it can actually slide comfortably into a jacket pocket or small compartment in your bag. Despite the diminutive size, the Pocket Keyboard has, what ZAGG assure us, is 85% of the surface area of full-sized keyboard. In use this basically means that the keyboard's fold-out stand will comfortably accommodate an eight to ten inch tablet without it looking weird, and in fact we've been mostly testing it out (including writing this review with it) alongside the ASUS ZenPad 8.0. 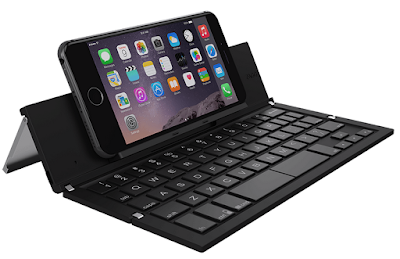 So a small and compact keyboard for a small and compact tablet. 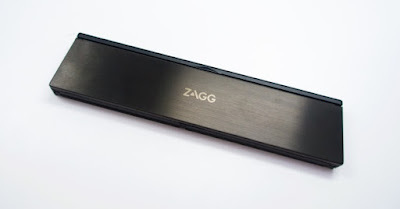 But, as we alluded to in the intro, the ZAGG Pocket Keyboard makes most sense when used in conjunction with a smartphone. The stand features a handy pop-out prop to keep smaller and thinner devices up, while the reduced width of the unit itself makes it look like a keyboard for a phone. As it unfolds and connects wirelessly to a device in mere seconds, this makes it great for students taking notes in lectures, quick business meetings, and also for longer typing sessions in places where you might not need (or want to take) your laptop. Charging the keyboard is done via Micro USB (so the same wire you'll have with you to charge your phone anyway), and thanks to the automatic switch off which kicks in when you fold it up, that battery will last a good long while between charges. It is also sturdy in the hand and thankfully the folding joints seem pretty rugged, so it should last you. We've reviewed loads of Bluetooth keyboards in the past, but this is the first one that has truly wowed us in terms of size and practicality. If you're sick of wearing out your thumbs on the touchscreen of your phone or tablet, but really can't be bothered lugging something around with you that you might not actually use, the ZAGG Pocket Keyboard is perfect.